63 published items with the word (s) or phrase Texworld USA in News, Trends, Videos, Photo galleries, Agenda and sorted by "date descending". Last year, the Chinese textile and apparel sourcing show broadened its range with great success, and for its spring edition on March 12-14 it is set to host 3,300 exhibitors and 80,000 visitors. The Paris shows organised by Messe Frankfurt reported a record attendance figure of 13,929 visitors for their edition held on February 11-14, up 2.35% compared to February 2018. One of the largest textile sourcing shows on the East Coast, Texworld USA will come to NYC's Javits Center for a round of talks on sustainability and more. The trade show will run from January 21 through January 23. China's top textile/apparel trade shows took a gamble when they chose to bring their dates forward for a better fit with the international fashion buyers’ calendar. The September edition of the trade show organised by Messe Frankfurt attracted 15,075 visitors. A decline of 2.6 percent compared to the record edition of September 2017. In the absence of direct investment by contractors, Bangladeshi factories are seeing modernisation hampered by the race for low prices and are struggling to win contracts for more high-end products. The Messe Frankfurt textile event is expecting 1,850 exhibitors from 17th to 20th September at Paris' Parc du Bourget, where it will be introducing new initiatives including a trade show focusing on leather. Texworld USA and sister show Apparel Sourcing are returning to New York this month to offer the largest sourcing event on the East Coast for buyers, developers, designers, merchandisers and sourcing professionals. 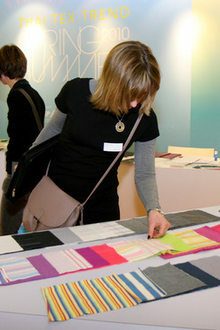 The Messe Frankfurt-organized textiles trade shows revealed on Thursday their summer 2018 seminar lineups, with sessions covering sustainability, autumn/winter 2019-20 color and fabric trends, and fashion law. Shanghai shows Intertextile, Chic, Yarn Expo and PH Value will be next held at the end of September, to keep up with the changes taking place in the fashion week and sourcing calendars. Pour leur édition de septembre, les salons de Messe Frankfurt ont attiré 15 075 visiteurs. Un recul de 2,6 % par rapport à l’édition record de septembre 2017 que l’organisateur explique par plusieurs facteurs. En su edición de septiembre, los salones de Messe Frankfurt han recibido 15 075 visitantes, un retroceso del 2,6% frente al récord de septiembre de 2017. El organizador señala varios factores. ...llegada de una nueva cita dedicada al cuero, Leatherworld. Entre tanto, se celebrarán las ediciones estadounidenses de Texworld y Apparel Sourcing, del 23 al 25 de julio, en el Javits Center de Nueva York. ...Lanciato lo scorso settembre all'interno di Texworld, l'appuntamento dei tessuti high-tech cambierà nel mese di febbraio del 2017, e crescerà diventando un “marketplace” e uno “spazio vitale”. ...Die Textil- und Bekleidungsmessen werden in dieser Saison durch die Texworld Denim vereint. Letztere, ehemals eigener Bereich, hat sich zu einer vollwertigen Fachmesse mit 80 Ausstellern entwickelt. Messe Frankfurt: "Ich hatte einen Modemarkt in Afrika...."
...Sponsoren und Paten gehört in diesem Jahr neben Bijou Brigitte, dem Texpertise Network der Messe Frankfurt sowie der Texworld Paris auch das Premium-Label Pierre Cardin. ...Keine Basis für Business: Die Frankfurt Messe hat die Herbstausgabe der Texworld in Istanbul (19. bis 21. Oktober) abgesagt. ...Die im vergangenen September an der Texworld gestartete Hightech-Messe für Stofftechnologie entwickelt sich ab Februar 2017 als „Marktplatz“ und „Lebensraum“ weiter. ...introduction of Boulevard Prêt-á-Sale expands Messe Frankfurt’s New York City show offering, which currently includes Texworld USA, Apparel Sourcing USA and Home Textiles Sourcing Expo. ... Российская студия регулярно участвует в ведущих текстильных выставках мира, таких как Premiere Vision в Париже и Нью-Йорке, TexWorld в Париже, Munich Fabric Start в Мюнхене и Intertextile Shanghai в Шанхае. Посещаемость салона Texworld Istanbul, прошедшего во второй раз, значительно снизилась. ...С 19 по 21 января три выставки – текстильная Texworld USA, денимная Kingpins и посвященная мужским товарам MRket - объединят усилия в новой инициативе. ...Os eventos dedicados ao têxtil/vestuário serão acompanhados, de 11 a 14 de fevereiro, pelo Texworld Denim, o antigo espaço especializado que se torna agora um salão pleno com 80 expositores. ...Lançado em setembro passado no Texworld, o encontro dos tecidos high-tech vai mudar em fevereiro de 2017 e ganhará amplitude como "espaço de mercado" e "local de vida". ...têxtil e do sourcing unem suas forças para se impor como mostra de envergadura no calendário do setor: o salão Texworld USA, o Kingpins e o MRket. ...ile güçlenmiş bir şekilde düzenlenecek. Eylül buluşmasına kadar ise, 23-25 Temmuz arasında, New York Javits Center’da Texworld ve Apparel Sourcing Amerika etkinlikleri gerçekleştirilecek. ...Frankfurt Afrika pazarına giriş yapıyor ve 2017 yılında Etiyopya’daki Afrika Sourcing & Fashion Week için üç tekstil fuarı, Texworld, Apparel Sourcing ve Texprocess’i, düzenleyecek. Messe Franksurt tarafından düzenlenen Türk buluşmasının ikinci etkinliği 7-8 Nisan tarihleri arasında İstanbul’da gerçekleştirilecek. Euromed ve Asya’dan 150’nin üzerinde sergici firma katılım gösterecek. Türkiye: Avrupa-Akdeniz’in büyük merkezi uyanıyor mu? Turquía: ¿el despertar de un gran centro neurálgico euro-mediterráneo? ...Os eventos dedicados ao têxtil/vestuário serão acompanhados, de 11 a 14 de fevereiro, pelo Texworld Denim, o antigo espaço especializado que se torna agora um salão de pleno direito com 80 expositores. ...Lançado em setembro passado no Texworld, este encontro dos tecidos high-tech vai mudar, em fevereiro de 2017, e ganhará amplitude como "espaço de mercado" e "local de vida". ..."sourcing" unem as suas forças para impor-se como um encontro de envergadura no calendário da fileira: o salão Texworld USA, o Kingpins e o MRket. Turquia: o despertar de um grande centro nevrálgico euro-mediterrâneo? ...One of the largest textile sourcing shows on the East Coast, Texworld USA will come to NYC's Javits Center for a round of talks on sustainability and more. The trade show will run from January 21 through January 23. ...organiser Messe Frankfurt has created TexworldDenim, a new event for denim specialists which previously exhibited at the Texworld and Apparel Sourcing shows. ...July, more than 837 exhibitors from 19 countries flocked to New York’s Javits Center for the summer 2018 edition of Texworld USA and Apparel Sourcing USA, where they were joined by over 5,000 visitors. ...Texworld USA and sister show Apparel Sourcing are returning to New York this month to offer the largest sourcing event on the East Coast for buyers, developers, designers, merchandisers and sourcing professionals. ...The 41st edition of Texworld Paris has met its target with the registration of 1,000 exhibitors from various parts of the world. ...3 to 6. Alongside the African schedule, three trade show brands will also debut -- Texprocess, Apparel Sourcing and Texworld. ...The 40th Texworld Paris show begins February 6-9, 2017 with 730 exhibitors, with this number showing an increase, particularly due to the return of previous exhibitors, who missed several recent shows. ...The trade show for fabrics, trimmings and accessories Texworld Paris, begins February 6-9, 2017, with around 650 exhibitors.